I’ve been saying “coming very soon” in the newsletter for some number of weeks now, but finally we can announce the launch of the iOS version of the Earth or Not Earth app. Now all of you “cool kids” with no Android devices can challenge yourself and your friends to games where you tell us, is it Earth or Not Earth? What planet is this picture from? 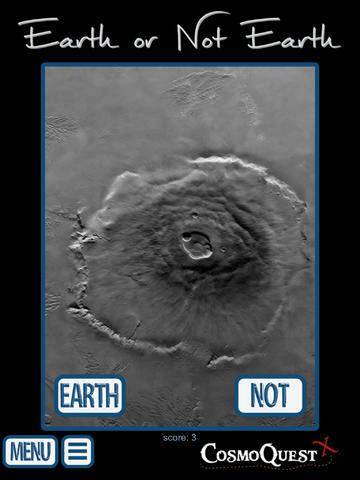 Or, the most difficult, play a matching game of planet surface features. Be careful you CAN get a negative score on that one. 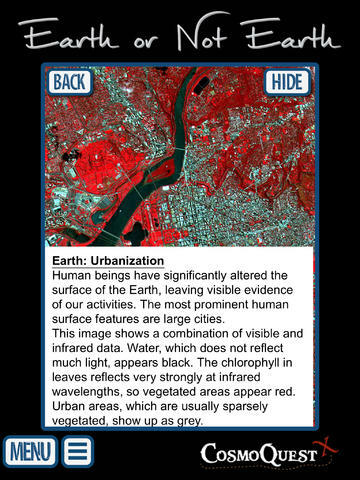 In addition, the app has a set of gorgeous vocabulary cards for various planetary surface features around the solar system. This game has been out for a while on the Android Store and is still available there. It’s been updated so you don’t need a CosmoQuest login to sign in. Just go ahead and play! Sales from this app in either store help pay for more science and education through CosmoQuest. Go ahead and give it a try! Make sure to leave us a review once you’ve given it a go.